I was in the middle of writing my new post for this blog with the intention to dedicate it to Marie Sklodowska Curie, the brilliant scientist and recipient of two Nobel prizes. She was an inspiration and role model for me while I was studying biochemistry in Warsaw — the city of her birth and mine (two generations apart). I thought March would be the perfect month for such a salute since it is dedicated to the celebration of women. When I learned that the play Radium Girls, written by D.W. Gregory and based on a true story, is being presented by Beowulf Alley Theatre here in Tucson, I knew that I had to see it! After all, radium was discovered and isolated by Marie Curie, my hero. So on a sunny Sunday afternoon at 2:30 pm — when I would rather be gardening — I was sitting in the dark auditorium of the theater watching Radium Girls. The play was emotionally exhausting for me and the Radium Girls stayed in my mind with such a persistence that I postponed writing about Marie Curie and wrote this instead. You might be familiar with the tragic story of the young women (18-year-old on average) working in the factory owned by the U.S. Radium Corporation in Orange, New Jersey, where “glowing” watches were produced. The Radium Girls, as they are now referred to, were painting the dials of watches with delicate brushes using paint containing radioactive radium. The girls were unaware of the deadly power of the paint. The factory management was unaware, as well…at first! When the danger became apparent, fear of the responsibility for the workers, fear of bad publicity, and fear of the financial consequences were too big for the corporation to face. As a result, the dangers of using radium were downplayed and the need to protect the workers totally neglected. Consequently the girls continued to paint the dials of the watches. In order to sharpen the brush points they continued putting them in their mouths and twirling them against their lips, each time swallowing a bit of the radioactive paint…. With today’s knowledge of radiation it is easy to predict the end of the story. 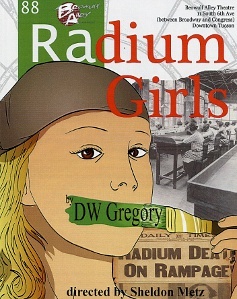 Since I did not grow up in this country, I was not even aware of the Radium Girls’ existence… till now. Sheldon Metz, the director of the play, did! He read about them in a Chicago newspaper when he was a 15-year-old boy. The story made a lasting impression on him and that is why there is an opportunity to see this play in Tucson. For that I am very grateful to him and the entire cast. The play takes us to Orange, New Jersey and requires setting our watches back to 1926 in order to enter the scenes full of authentic characters of that time. The focus of the play is Grace Fryer, one of the watch painters at the Orange factory, who slowly becomes aware of the danger of the painting job by seeing some of her friends getting deadly sick. In spite of quitting her job and finding a safer one (in a bank), she becomes very sick and faces the prognosis of only one year left to live. Her decision to fight the U.S. Radium Corporation and her painful struggle with that decision are remarkable — and worth seeing in the performance by Nicole M. Scott. I was glad that the character of Arthur Roeder, president of the corporation, was not overdrawn and made into a caricature. Jared Stokes convincingly personifies Roeder in a way that it is not possible to like him, but also not easy to hate him. Every member of the cast, except Nicole, plays several characters and that was pretty amazing for me. They all deserve a standing ovation, but it is the Grace Fryer character that stole my heart. The Radium Girl, Grace Fryer, became one of my heroes. Grace’s type of heroism is often unrecognized because it is not action oriented or driven by an overpowering personality. It is not like the act of heroism by a soldier, rescue team member, fire fighter, or ordinary bystander responding to a dangerous situation requiring a quick, decisive action. No! She is a different type of hero; she becomes a hero through a painful metamorphosis. And metamorphosis requires time. This very young girl is changing slowly in front of us into an aware, decisive, and strong young woman. That does not happen by some magic, serendipity, or blind faith in a supreme being’s help. Such a metamorphosis comes with the pain of shedding different skins of fears and doubts. And Grace had plenty of them while struggling with the overwhelming power of the U.S. Radium Corporation and, in addition, with her mother and friends who fear that her battle for justice is useless and will backfire. Of course she desires some physical comfort and a bit of financial security while facing the prospect of imminent death. Such comfort is tempting and is offered to her a couple of times… for the price of being silent. She has to re-examine her decision each time she is tempted. Grace does find the strength to stand for what she believes “is the right thing to do” in spite of all the forces going against her, in spite of her loneliness, in spite of her despair. That is why she is a hero for me. Text copyright © 2012 by Alicja Mann. Did you ever wonder why people carve their names or initials on tree trunks, benches, and other objects? And did you notice that more significant places often have more of those markings? 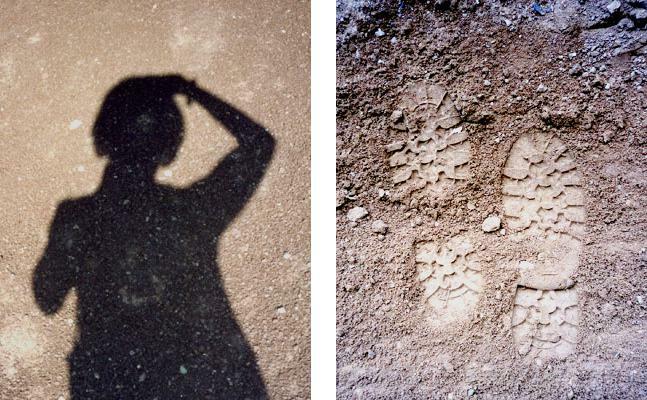 That strong desire to make a statement “I was here!” is as old as the human race—a desire to make and leave behind some sort of sign, a “footprint” of existence. I probably would not have thought about this at all if I had not found an almost forgotten photograph of my footprints, or rather boot prints, from several years ago. 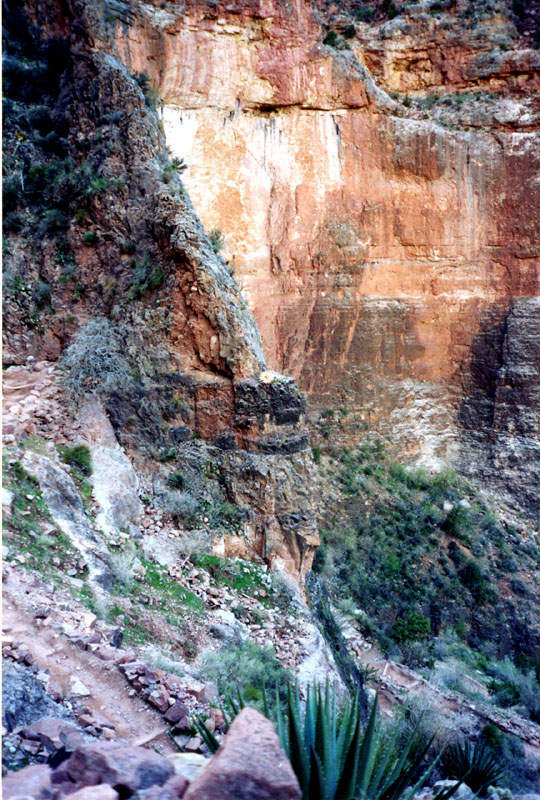 I was sorting through piles of my photographs in preparation for the recent art exhibit and there it was—the photograph of my boot prints in the Grand Canyon! 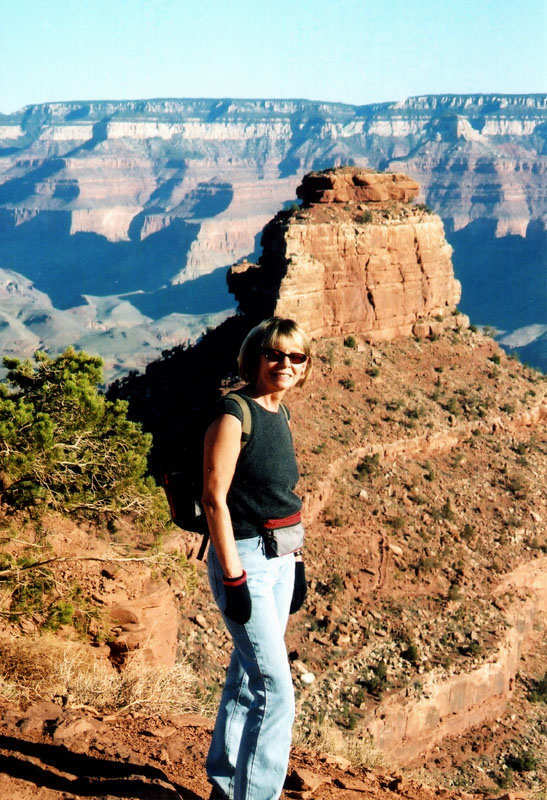 And there also was another photo showing the boot prints of my Canadian friend, Joan, with whom I had undertaken the challenge of hiking that incredible canyon – down and up in one day! These footprints in the dust of the trail were a short lived statement of my presence there. Short lived, but definitely a bit longer than the bare footprints I make at the edge of the ocean each time I walk on the wet sand of Silver Beach when I am on Cape Cod. There the very next wave smooths out the footprints and the following one makes them disappear totally. I never had an impulse to take a picture of my footprints there— maybe because that beach is so familiar to me. 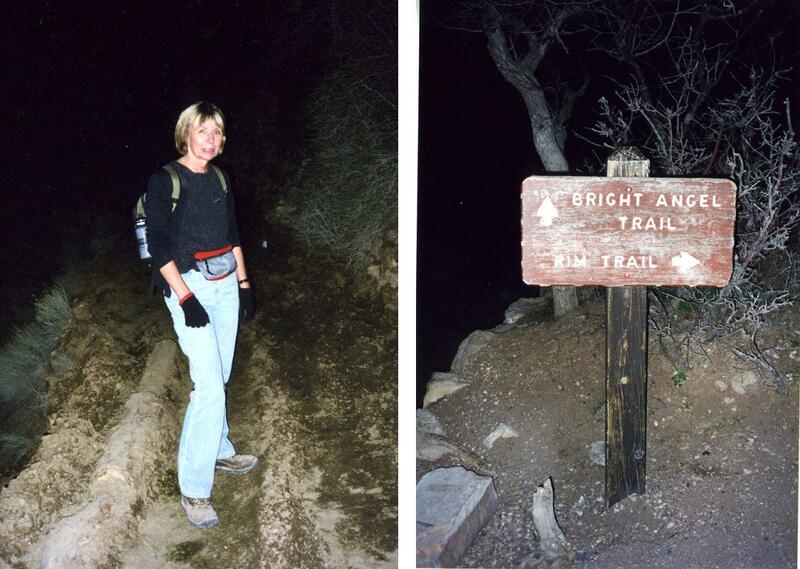 Similarly, I did not have that desire on any mountain hikes around Tucson, even though the mountains here are very beautiful. 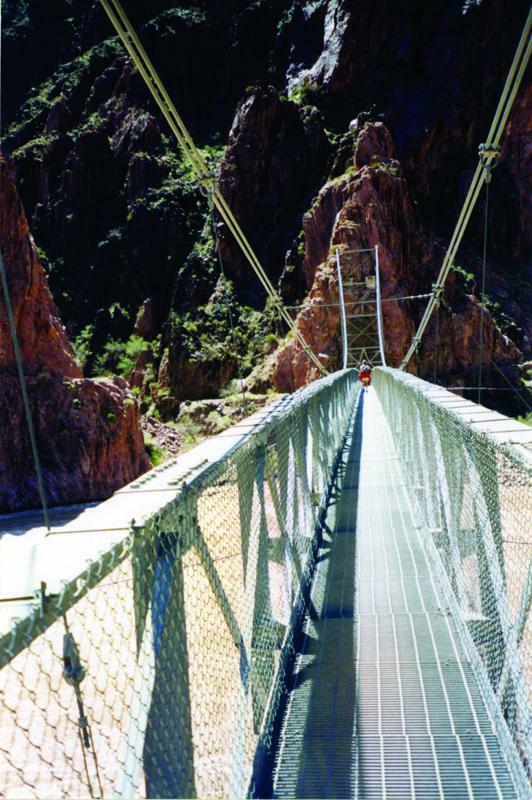 Just being at the Grand Canyon evokes an unforgettable feeling of awe and humbleness, but hiking it, measuring myself against its giant scale of space and time is indescribable. 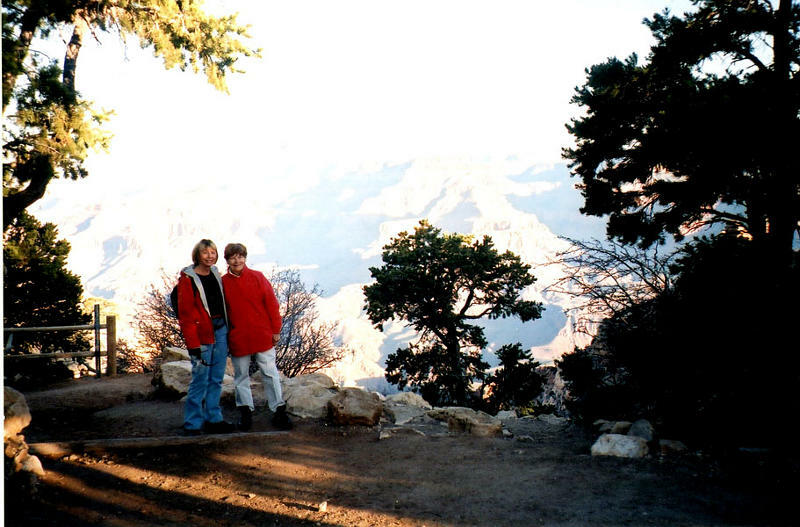 That’s right—the magnificence and hugeness of the Grand Canyon was so overwhelming and the sense of my minuteness there against the background of the rocks formed through the millennia of time, made me feel like shouting, “I am here! I am really here!” Hence the footprint photo and many other photos that captured that adventure. Now these photos seem flat and very one dimensional, and can’t adequately illustrate the beauty and power of that place. Still, I will share a few of them with you. 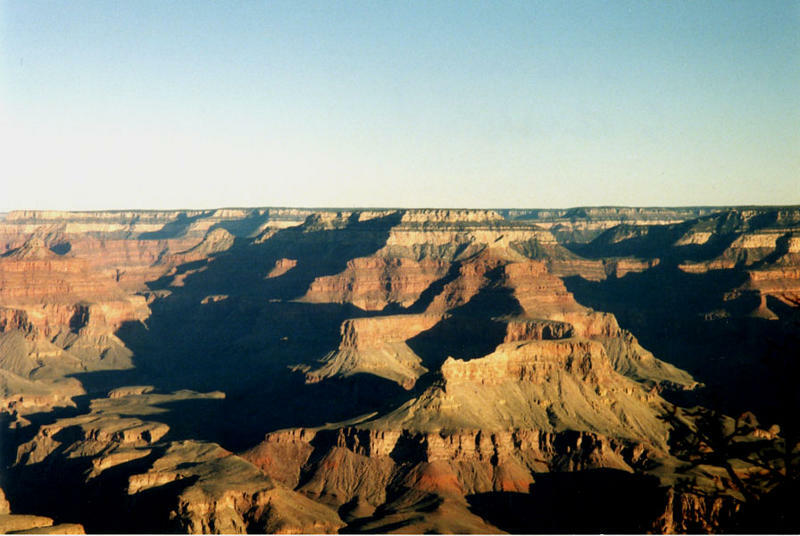 If you haven’t been there, I hope that you do go—after all it is one of the wonders of the world, and was not man-made, but created by nature over millions of years! 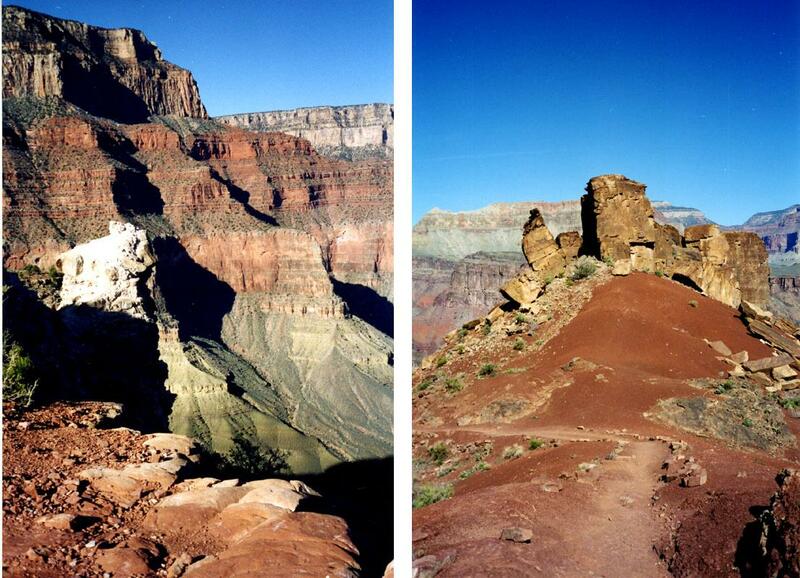 My boot prints in the Grand Canyon disappeared almost immediately while the boot prints on the moon probably remain unchanged. There are no winds on the moon to erode them, so they might be there forever. Here on Earth our physical presence is fragile and temporary, but we humans are clever and capable of making different, more permanent “footprints” to mark our short time of existence. No one wants to be forgotten or insignificant. So we often strive in a variety of ways to make “footprints” of our lives. One way is through creative work: writing, painting, composing…. 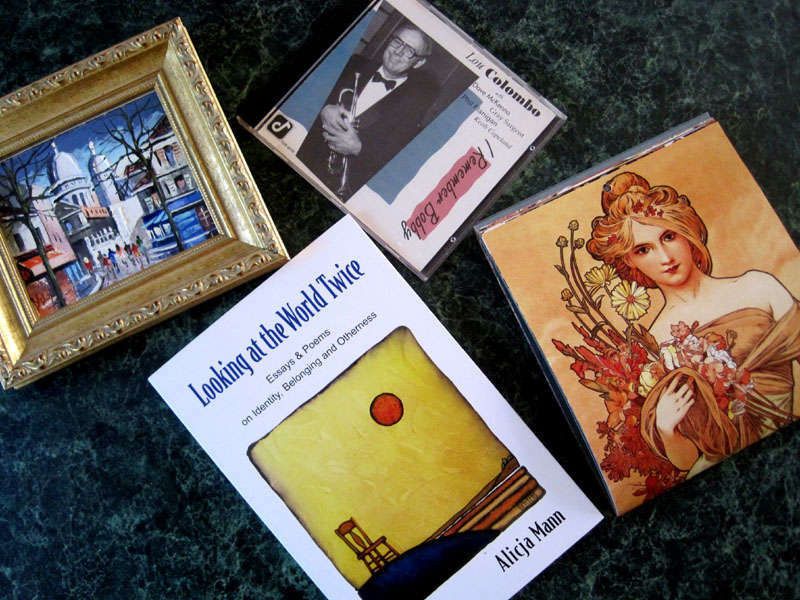 As a result we create books, paintings, records, and photographs that can live on after we are gone. I was reminded of this just a few days ago. Lou Colombo, a jazz musician whom I knew from Cape Cod and whose trumpet playing I love, died last Saturday in a car accident. That was terribly upsetting. However, his music will stay with us. I know it will stay with me. That is right, it all depends on you…. P.S. To learn more about Lou Colombo click to read Cape jazz legend Lou Colombo dies in the Cape Cod Times. 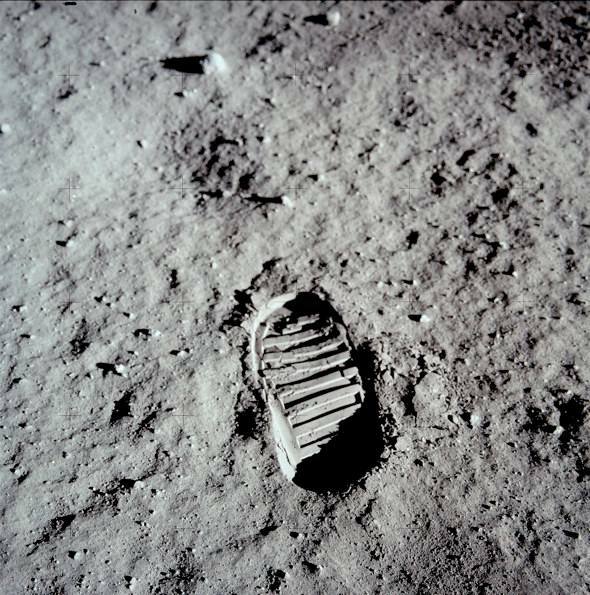 Boot print on the moon photo from NASA. Alicja’s photo by Joan Agnew. Lou Colombo photo by Ron Schloerb/Cape Cod Times. Text and other photos copyright © 2012 by Alicja Mann. Text and photographs in this blog (unless otherwise noted) copyrighted by Alicja Mann.